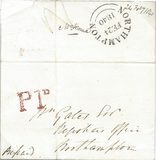 1848 Cover to Peterborough from Chatteris showing on the reverse, a very fine PETERBOROUGH/MR 20 1848 SKELETON DATESTAMP - ONE OF TWO RECORDED EXAMPLES. 1853 Envelope addressed to Stamford franked by a 1d Red-Brown, SG 8, showing a very fine Water-Newton (under Wansford) undated circle in Green. 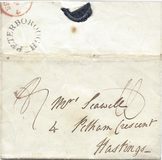 1835 Cover addressed to Hastings with, on the reverse, a very fine PETERBOROUGH undated circle, NN 193. 1859 1d Pink Envelope to London with, on the reverse, a fine CASTOR (under Peterborough) undated circle. 1799 Entire addressed to Rochdale, Lancashire showing on the front, a very fine STRAIGHT LINE PETERBOROUGH, NN 186. SCARCE. 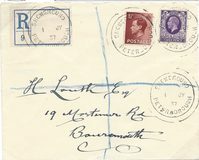 1806 Cover addressed to London with, on the front, a fine PETERBORO/78 mileage mark, NN 189. 1786 Entire to Market Raisin endorsed "Turn at Stilton" showing a VERY FINE "78 PETER/BOROUGH" FIRST-TYPE MILEAGE, NN 181. 1788 Entire addressed to York endorsed "Turn at Stilton" showing a VERY FINE TWO-LINE PETER/BOROUGH, NN 182. Posted on Christmas Day. 1835 Entire addressed to Woburn, Beds showing on the front a very fine Type 3 "Peter./-borough/Penny Post" and Boxed No 4 Receiver. 1804 Entire to Rochdale with, on the front, a very fine Towcester/60 mileage, NN 241. 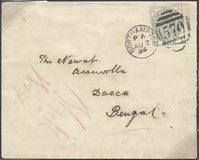 1839 Cover to Leicester showing on the front a very fine boxed three-line PETER/-BOROUGH/PENNY POST and boxed 'No 1' Receiver. 1823 Entire from London to Brackley showing a fine two-line MISSENT-TO/NORTHAMPTON. 1859 1d Rose-Red, SG 40, F-B, tied to mourning envelope to Andover by a fine NORTHAMPTON 570 duplex showing on the reverse, a very fine SPRATTON circular-framed undated circle. Very Scarce. 1806 Entire to Rochdale showing a very fine abbreviated PETERBORO/78 mileage, NN 189. 1870 1½d Rose Red, SG 51. SUPERB USED BLOCK WITH PETERBOROUGH CIRCULAR DATESTAMPS, Plate 1.